Brandon Patterson named finalist in NAHB Young Professional Awards. In January the National Association of Home Builders (NAHB) held its International Builders Show (IBS) in Orlando, presenting the 2nd Annual Young Professional Awards at the same time. Des Moines’ own Brandon Patterson, Realtor with Re/MAX Real Estate Concepts in West Des Moines, was one of 20 finalists nationwide. That environment taught Patterson that the construction trades are more than just jobs; they are skilled trades in which the best professionals take great pride. The next year, in true Brandon fashion, he jumped in with both feet and ran the Home and Remodeling Show himself. That’s when Knoup and Patterson first met. 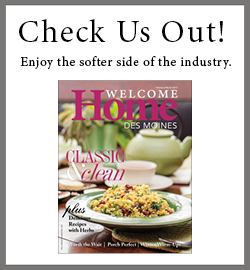 In addition to his role as a member of the HBA of Greater Des Moines’ Executive Committee, Patterson still serves on the Home and Remodeling Show committee, the Waukee Chamber of Commerce, the Engagement committee for the HBA of Iowa, and is a founding member of the new Realtors Young Professionals committee. The role that gets him most animated professionally is the one he performs for the Iowa Skilled Trades organization. In addition to last year’s dinner event featuring Mike Rowe, the organization helped Des Moines’ Central Campus with a summer day camp last July to introduce students to some of the construction trades. Plans are already in the works to host another one this summer, as well as “Dozer Days,” which will teach students about the equipment side of the construction trades. Excitement and publicity from the Mike Rowe event has brought in more donors, which opens up more possibilities for the Skilled Trades group. But one thing Patterson says is still needed is volunteers. One immediate administrative need is to get the group’s website updated. The site currently provides information about past events, links for donating, and links for purchasing promotional items, but Patterson envisions the site becoming a one-stop shop for students, educators, and parents, offering even more details about scholarships, links to applications, and links to schools and apprenticeships. Patterson was excited to attend the IBS show and awards presentation in Orlando, but he said one of the highlights of that trip was the buzz about the Mike Rowe event. From the initial applications, 20 finalists were selected, representing the five NAHB regions across the U.S. Only three of those finalists were real estate professionals, including Des Moines’ Brandon Patterson. Nominees were judged by a panel of five, based on these categories: innovation, career progress, industry involvement, and leadership development. Learn more about Iowa Skilled Trades and the organization’s upcoming events, become a sponsor, volunteer to be a part of future activities, donate to support scholarships and events, and get your own Iowa Skilled Trades hat or t-shirt—visit IowaSkilledTrades.com. Check out the group’s Facebook for highlights from September’s event. To find out more about Central Campus and the Skilled Trades Academy.